A few years ago I heard Steve Biddulph, author of ‘Raising Boys’ speak about parenting. One of the things that struck me was how he talked about traditions. I hope I’m not misquoting him but I seem to remember his speech going along these lines “Children who have grown up in happy families look back on their youth and say ‘remember when…’ as parents we have to provide the traditions that our children will remember with fondness”. He talked about families that spent one night a week all ‘camping out’ on mattresses in the same bedroom to illustrate that traditions don’t have to be expensive, they just require the willing input of the family, particularly the parents. This all comes to mind now, as I look back on our recent Easter holidays. Traditions are becoming ingrained within my family and our friends family, who we share our break with. This year is the third year that we have spent time together at my Sister and Brother-in-law’s farm in Cumbria, in their simple holiday cottage. You can see posts from last year and the year before here, here and here. You may notice that I take pretty much the same photos every year, all that changes is the weather and the size of the children. Every year our children look forward to helping out with activities on the farm. They herd the sheep, feed the lambs, look for eggs, fill up the hopper on the turnip masher (I’m sure there is a proper name for this bit of farming kit but I don’t know what it is), throw straw around in a vain attempt to put bedding down for the cows, feed and water the indoor sheep and venture up to the fell top to feed to the hardier sheep up there. Then there is playtime; they build straw bale castles with their cousins, splash stones in the stream, collect ‘crystals’ from out of the stream, kick a football and ride a bike. Together we have Easter egg hunts and walks over the fell, share meals and bedtime rituals. As each year passes, they have more things to look forward to as they remember the things they did the year before. Long may it last. We are already booked in for next year! Put on your wellies, warm clothes and waterproofs because we are going to visit a Cumbrian hill farm. Just look at those snow drifts piled high against the dry stone walls. A few days before this photo was taken the road was completely blocked. When I took this photo the weather was dry and fairly bright, despite the cloud. The air is cold, clean and crisp up here. Turning to the left we can admire the landscape of deceptively dry-looking open fell and the snowy North Pennines in the distance. Carrying on along the road, the modern farm house comes into view. Usually by this time of year the fields at either side of this road are starting to fill up with ewes and new lambs but the long winter has delayed things a bit. Cross the cattle grid into the farm yard. This road is actually a public bridleway as you can see from the photo. When the weather is better this is a fairly popular route with cyclists. They often speed through the farm with the sound of several barking sheepdogs ringing in their ears. Turning around 180 degrees to look back on the cattle grid and the view over the fell. After passing through the first part of the farm, we carry on into the older part of the farm. Straight ahead is the byre where the sheep are brought if they need more help during lambing time. You can just see a tiny bit of white wall beyond the byre. That is the old farm house, now a holiday cottage, where we stayed. Now we have arrived at our accommodation, complete with genuine farmer in high viz jacket (my brother-in-law). This house dates from the 1700’s and is built right into the slope of the hill. This is the view from the front door of the cottage. The photos from top to bottom, left to right are as follows: looking to the right the public bridleway continues up to Loadpot Hill after first dipping down to the foot of the valley. Straight ahead is the building where the cows overwinter and to the left is the picnic table and beyond that the sheep maternity ward byre. The green frame on the door is surrounding a new heavy duty mesh door that has been put in place in an attempt to keep the badgers out. Badgers have caused a bit of trouble this year. I suspect that they are being driven to attacking lambs as their normal food is running thin due to the hard winter. While we were there, my brother-in-law saw badgers in his main barn during daylight hours, eating the cattle feed. That is not normal behaviour. Inside the house there is a cosy living room with an even cosier stove. Thankfully these days there are also some electric wall heaters, otherwise it would be a very cold place to stay. This is the view from the kitchen window. It’s a cracker, though it is sometimes obscured by a sheep peering in. There is one house further up the valley, you might just be able to pick out the roof, four squares in from the left and five whole squares up. It is currently under major renovations. I’m sure it will be on ‘Grand Designs’ one day. I remember poking around in it a few years ago and it was completely derelict with no access road, no mains water or electricity. I’d love to see it when it’s done. The mesh on the window is a bit of a necessity because it’s base is actually level(ish) with the ground outside and the area beyond the window often acts as a sheep pen. You can see this in the picture above. I’m always entertained when a sheep strolls past while I’m washing up. Here is the same view but taken from an upstairs window. I would really like to take you on a little photographic walk down the snowy track next to the fence but I’m not sure my photos are good enough. I hope you have enjoyed this little visit to Scales Farm (click on the link for more photos). It’s well worth a visit for the views alone, which I can’t do justice to with my camera. I’ve been meaning to make one of these fruit cakes for weeks. 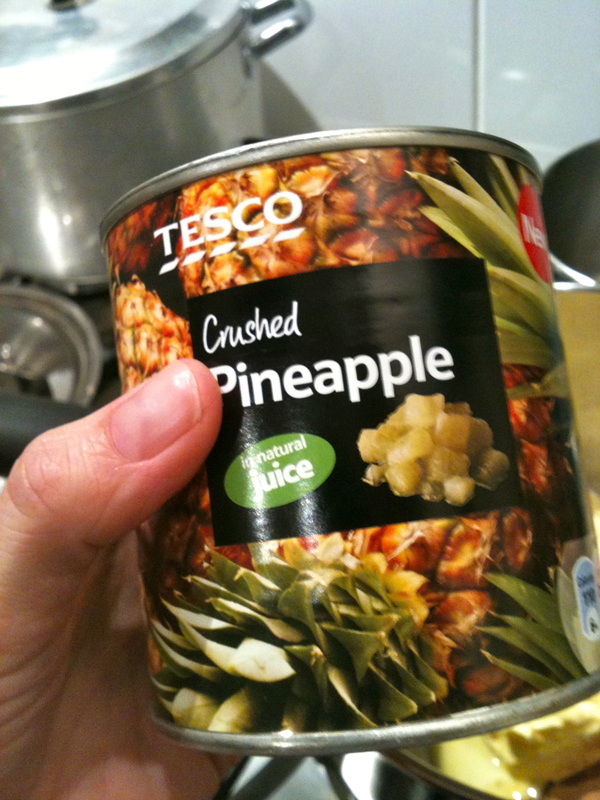 My local supermarket has recently taken to stocking the crucial ingredient: crushed pineapple. Every time I’m in the tinned fruit section and I see these tins I think “I must get one of those, they don’t have them in here very often”. So now I have several tins sitting in the back of my cupboard, waiting to get used up.As far as I know this is a proper ‘farm house’ recipe. It was given to me by my sister-in-law’s, mother-in-law, a woman who spent her whole married life on Cumbrian farms. If you’re not familiar with farm house life, you may not realise what a big deal afternoon tea is. I don’t mean a delicate, cucumber sandwiches with the crusts-cut-off kind of afternoon tea. No, no, this is the kind of tea to put hairs on your chest and give you the energy to get back out among the ‘beasts’ (that’s Cumbrian for cows) whatever the weather. Making this cake always takes me back to my final Easter vacation from university. I’m sure I must have had revision to do, but I don’t remember doing it. I had a completely idyllic four weeks on the edge of the Lake District, even the weather was great. I went to stay with the Husband (when he was still just the Boyfriend) and together, we went to stay with his sister, at her farm. We had been drafted in to help with lambing time because she was in the early stages of pregnancy and her husband had to go into hospital for minor surgery. Her mother and father-in-law were also helping out and that is how I came to know Joyce and her cake. Joyce and Doug had fairly recently vacated the farm house in favour of a nice semi in town, so she still felt at home in the kitchen. 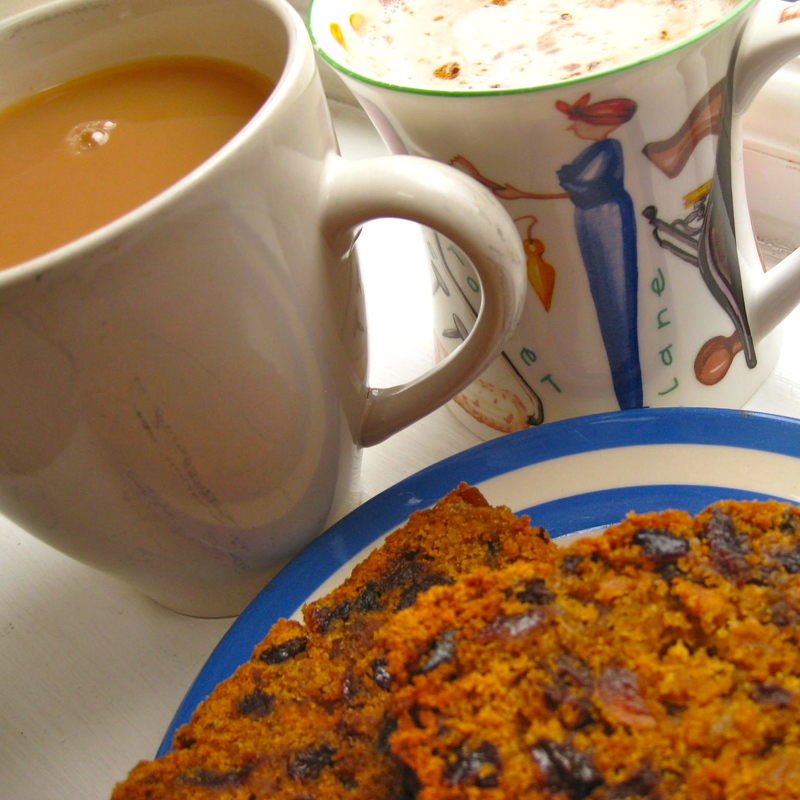 Every afternoon she would lay out about five different kinds of cake or biscuit and make a cuppa for us all. 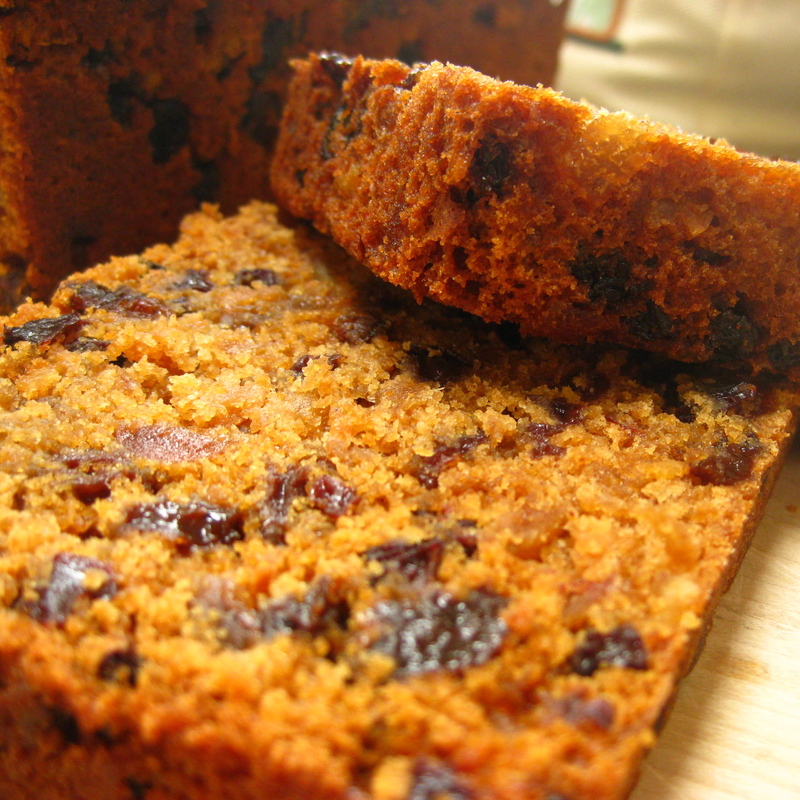 She must have made a few of these fruit cakes in advance because there was often a good sized slab of it on offer. 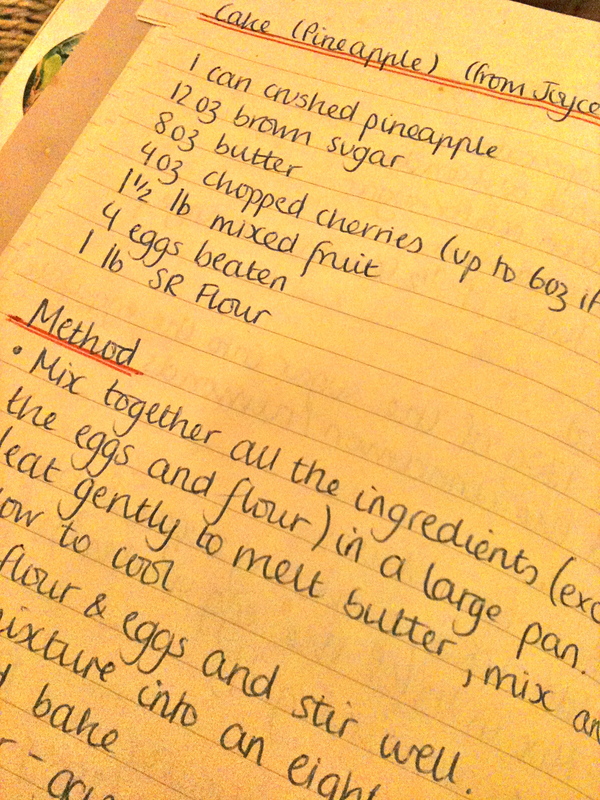 Later, when I moved to the area, I was able to call on her at home and nab the recipe. Joyce passed away a few years ago but now her cake is going to be immortalised on the World Wide Web. I wonder what she would have made of that? Like my No Fail Muffins, the thing that makes this cake easy is that there is no creaming involved. You simply put all the ingredients except the eggs and flour into a large pan, heat gently, mixing all the time until the butter has melted and the sugar has dissolved. 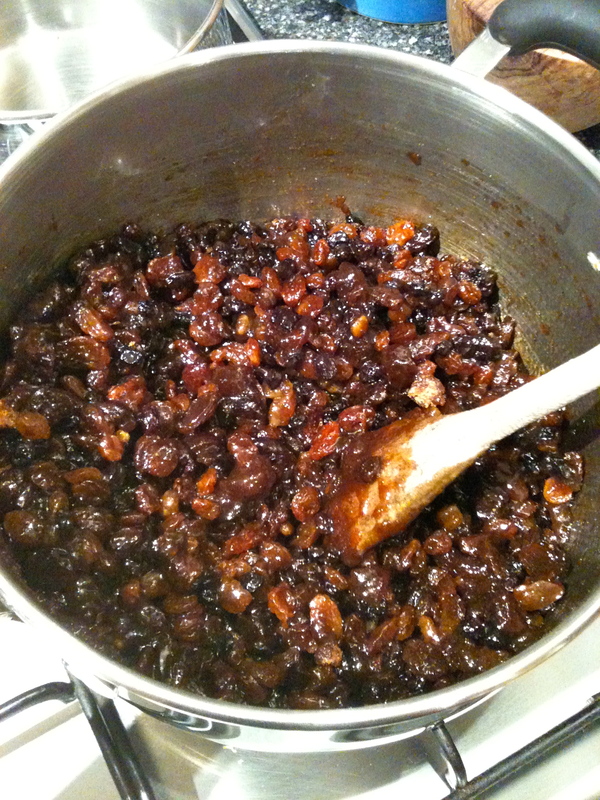 At this stage you should have a pan full of glossy looking dried fruit. If your mixture is very hot, allow it cool for a while before mixing in the flour and beaten eggs, otherwise you may end up with scrambled egg cake. The final mixture is sloppier than a traditional fruit cake would be. I baked mine in an eight inch square tin, lined with greaseproof paper. I think it would have worked out ok in a slightly bigger tin as the resulting cake was quite deep. I seem to remember getting good results by splitting the mixture between two (or maybe three) fairly decent size loaf tins. It does rise a little so be prepared. I made a big mistake when I cooked mine last night. I only gave it half an hour at the higher temperature. No wonder it was nowhere near cooked after the second stage. In the end, my cake had half an hour at 150C, followed by 2 hours and 20 minutes at 120C. Then, as it was approaching midnight, I left it in the oven after I switched it off, in the hope that the last bit of residual heat finish off the cooking. Luckily for me, it seemed to do the trick. Oooh, it was nice with my morning coffee. With that much fruit in it, it’s almost healthy too. How many slices do you think I’d have to eat for it to count as one of five a day?